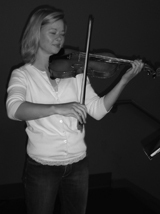 Back in February of 2007, a new member of Grace made an appointment to show me her violin skills. I'd always loved the thought of adding a fiddle/violin to the worship at Grace and loved the idea. I knew it would take someone with a unique talent to be able to transform the way they play classically to our rocky style. When Lynnora picked up her violin and played with my acoustic guitar "Come Thou Fount" I knew she would do an awesome job. Her first time on stage was during our March Ignite back in 07. What I enjoy even more than Lynnora's violin playing is her faithfulness to God and her desire to serve Him. She has a huge heart for missions along with a heart to lead people in worship. During the Christmas season Lynnora learned the Transiberran music and did an AMAZING job. Lynnora has become an integral part of the Grace Weekend Service Team providing inspiring violin playing, an awesome heart for people and a huge heart for leading people in worship. Lynnora is another reason I love being a part of the WST at Grace Church! If you see Lynnora this week, be sure to tell her she's SUPER COOL!!! !